The record-breaking European Poker Tour Barcelona €5,300 Main Event finished off with a marathon 15-hour final table and an epic heads-up battle that went on for six hours on its own. There had been a total of 1,496 runners who'd stumped up €5,300 to play the first EPT event of Season 11. Of course, there could be only one winner and that man was Andre Lettau, the German taking home the title and €794,058 after a deal was made three-handed with Samuel Phillips and Hossein Ensan. Phillips took the vast majority in the deal, banking over a million Euros in total (€1,021,275), while Ensan picked up €652,667. Ensan had started the day with the chip lead, the only player with over 10 million in chips. Lettau was the first to make a move early on, winning four pots in a row, pushing himself up the leaderboard. Phillips also made some early running, taking the chip lead after he picked up aces and got paid off by Ensan's on a jack-high board. Slaven Popov was the first player to be eliminated, moving all in for his last 10 big blinds with the but running into Ji Zhang's in the big blind. A third queen on the flop quickly ended the Bulgarian player's hopes, and he took home €121,300 as consolation. Phillips continued to dominate the rest of the players, constantly keeping the pressure on the rest as they were forced to concede pot after pot due to ICM. Zhang was next person to be eliminated. He squeezed with the after Ensan had raised with the and Andrey Shatilov called with the . Ensan quickly reshoved and Shatilov got out of the way. The board came to leave six players remaining. Kirl Radzivonau busted in sixth place. He called all in with the in the big blind after Phillips shoved the small blind with the . No queen or jack came for the Belarussian, and he left with a €224,500 payday. Shatilov was the only player on the final table who had previous EPT final-table experience, having made the PokerStars Caribbean Adventure final table a couple of years ago. The Russian had played well, but found himself short and moving in with the . Lettau made the call with the and dodged several bullets on the board, leaving just four players left. Andrea Dato was eliminated in fourth place, three-bet shoving with the over the top of an Ensan raise. The German player called with the — a dominating ace that made a straight on the board. Having previously folded to a big bluff from Ensan, the American Phillips won a monster pot against the same opponent when he called a five-bet all in with the . Ensan showed the but couldn't spike a two and Phillips regained the lead. At this point the three remaining players got into a heated discussion for nearly half an hour, working out a deal that left €90,000 for the winner. After a dinner break, Lettau would eliminate Ensan after making a good call on the turn of an board with the . Ensan could only show the , and the on the river changed nothing. Lettau started the heads-up battle with around a 5-1 chip lead against Phillips, but the latter doubled up in one of the very first hands with aces against Lettau's ace-six of clubs. The deficit was reduced to 2-1 instantly, and over the course of the next few hours the lead swapped several times. Phillips was at one point just a single card from victory with pocket fours against king-three, but Lettau spiked a king on the river to stay alive. After 141 hands of heads-up action — more hands than in the rest of the final table itself — the tournament finished on Hand #273. Phillips shoved with the and Lettau called with the . Lettau won when the board ran out . 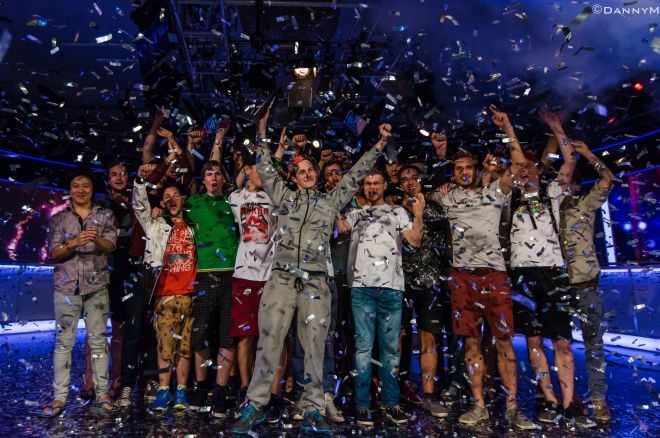 With that, Lettau became the first EPT winner of Season 11 after a truly gruelling battle. Now, all eyes will turn to London for the next event at the start of October in just over a month. The PokerNews Live Reporting team will be there, so make sure you join us for that.